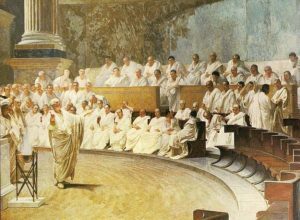 In this talk Richard Epstein, NYU Law, will discuss the relationship between natural law and Roman law in order to get a better understanding of how all modern legal systems tend to develop in response to these early texts. The talk will deal with the tension between natural and positive law, and with the fundamental distinctions between private and common property, which are governed by antithetical legal regimes, each of which makes sense in its own domain. The Romans never thought of their material on natural reason as relating to any modern conception of social welfare. Nonetheless, the rules that they put together were consistent with such modern conceptions, for it was only by the adherence to those principles that they Romans were able to survive and succeed in ancient times when many other nations failed. Lunch will be served. After you RSVP, you will be emailed the assigned readings. If you have any questions, email Laura Creste at laura.creste@nyu.edu.